After 6 weeks on the road, we made it to our first deadline: Missoula, Montana. e arrived in Missoula around midday and then picked up my dad from the airport that evening. The following day Sam and I parted ways for the first time in nearly 7 months. She returned south towards Yellowstone National Park, while Dad and I checked in to a quaint Bed and Breakfast situated on the bank of the Clarkfork River that runs through the centre of Missoula. Later that night we caught up with my Uncle Loren and his long-time friend and fishing partner Tom, and went to dinner at a local pub. The next morning started with a 5.30am wake up to prepare to meet our fishing guides at 6.30am and head out to the river to start fishing. The guides arrived with their two trucks towing 3-person drift boats and we made our way to the drop in point, north on the Clarkfork River. We would spend the next few days fly fishing from the boats while drifting along the river. The guides were invaluable, helping us with our gear, tying knots, untangling our messes, and most of all coaching us in the ways of fishing by helping us with our technique and pointing out the best spots to ensure that we caught fish. We caught almost exclusively trout, of which there were three varieties: Rainbow, Cut-throat, and a hybrid of the former called a Cut-Bow. This fishing was exclusively “catch and release”, ensuring that we returned the fish the water as quickly as possible. The guides were determined to protect the fishery and the showed a genuine concern and respect for the fish, often encouraging us to hold our breath for the duration of the time that the fish were out of water to experience what we were putting these beautiful creatures through. In most cases, this was a matter of a few seconds from moment the fish was netted, hook removed and then released back into the river. 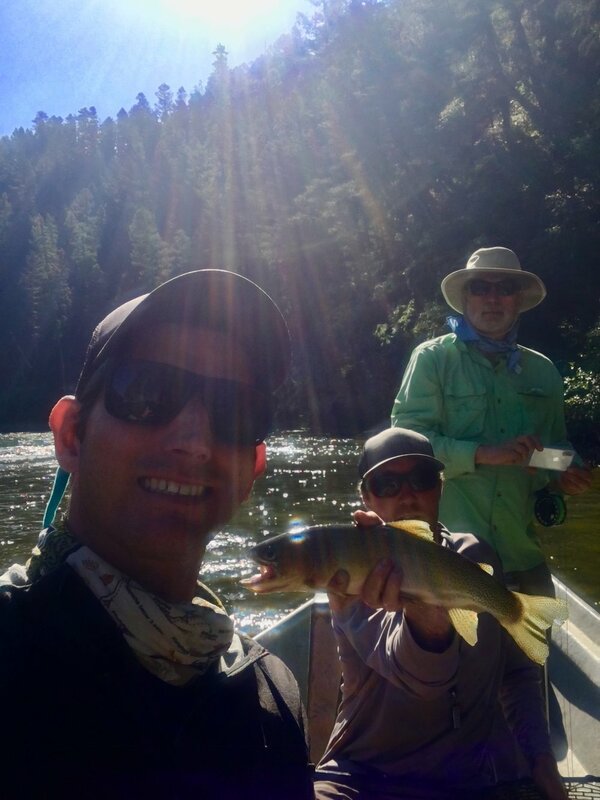 The first day was highly successful, despite us amateur fishermen needing some time to dust off our fly rod casting and hone our technique with the help of our guides. We caught many fish and enjoyed the stunning scenery that the upper Clarkfork had to offer. At around 3pm, the sun was blistering and we called it a day to head back to our air conditioned rooms to relax before going out for a nice sit-down dinner. The next day we split up into two groups, and fished different sections of the the river. Tom and I were fishing together and our guide took us down a stretch of river that was a mere 10 minutes away from Missoula. He said that for some strange reason people rarely thought to fish this section because of its proximity to the city. We had a completely actioned-packed day, catching nearly 40 fish between the two of us. This worked out well, because by lunchtime, the heat was so unbearable we opted to call it quits and meet back up with my Dad and his brother. That night we went out for dinner and shared our fishing stories from the day, and obviously talked politics, because, with my family, that’s inevitable… We made sure we fueled up as much and possible as planned to fish on the famous Blackfoot River (as featured in the book/film A River Runs Through It) the next two days. As group we elected to meet an hour earlier the following day to minimise the time in the heat and improve our chances of being the first boats on the Blackfoot and therefore improve our fishing experience. The Blackfoot was equal parts breathtaking and fantastic fishing. The mist rising off the cool water as the sun rose behind the mountains of Montana was a spectacular site. After about an hour on the river we reached the Canyon, with its sheer walls rising up out of the surface of the water on either side of us. We saw bald eagles, hawks, wild deer, beavers and hoards of insects, from which our guides drew inspiration for the fly lures we used to catch fish. We returned here for the last two days of fishing and it was fantastic. On our second day we witnessed the first day of the Spruce Moth hatch, where the larvae have developed and hundreds of thousands of grey spruce moths take flight, many of which end up in the river, sending the trout into feeding frenzy. This was particularly fun as we used a spruce moth 'dry' fly, which would float on the surface, making for spectacular 'takes' when the fish would virtually leap out of the water to eat the moth-look-a-like. It took precision casting to make the fly appear natural and we were competing with all the real moths that were floating down the river. This was by far the most fun I have ever had fishing! After our two days on the Blackfoot, Dad and I left Loren and Tom to continue fishing in Missoula. We made our way to Albuquerque, to meet up with Sam, Mom and eventually Anu and Simone (my sister and her daughter).